Medallion Cabinetry by Elkay offers a nearly limitless array of styles, wood finishes and customizable cabinetry to create built-in furniture for the kitchen, bath, and other living spaces throughout the home. Every cabinet is engineered to last and backed by a lifetime warranty. Our commitment to craftsmanship begins with our product designers who create better solutions for the ever-changing American home, and continues with our craftsmen and women who bring the innovations to life. Our choice to use local forests and manufacture cabinetry in the United States shows our commitment to sustainability and country, building a future for generations of employees, customers and consumers. Our dedication to providing our customers with an outstanding product has not gone unnoticed. In May, 2012, Medallion Cabinetry was awarded “Best of Remodeling” by Houzz.com, the leading online platform for residential remodeling and design. 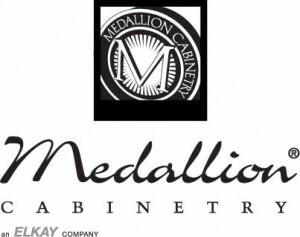 Check out the Medallion Cabinets Videos. Check out the Medallion Cabinets Brochures.